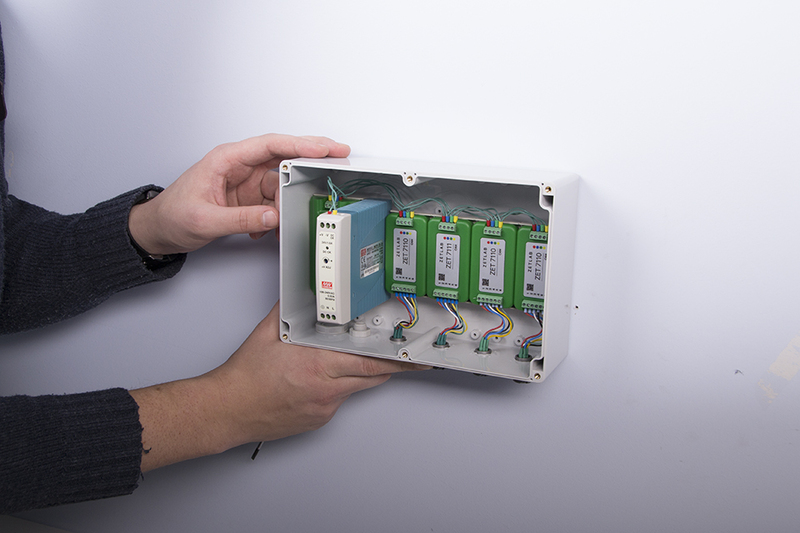 Seismic detection system based on ZETSENSOR series products has been developed for the prevention of risks relating to the use, maintenance, control and emergency operation of elevators that have been exposed to seismic impacts. The system may also be equipped with primary wave detection system if it is used for control of elevators having balancing weight and side counterweight. In the case if the system is going to be used for elevator control purposes only, it can be placed in the elevator well of the lowest elevator of the building. 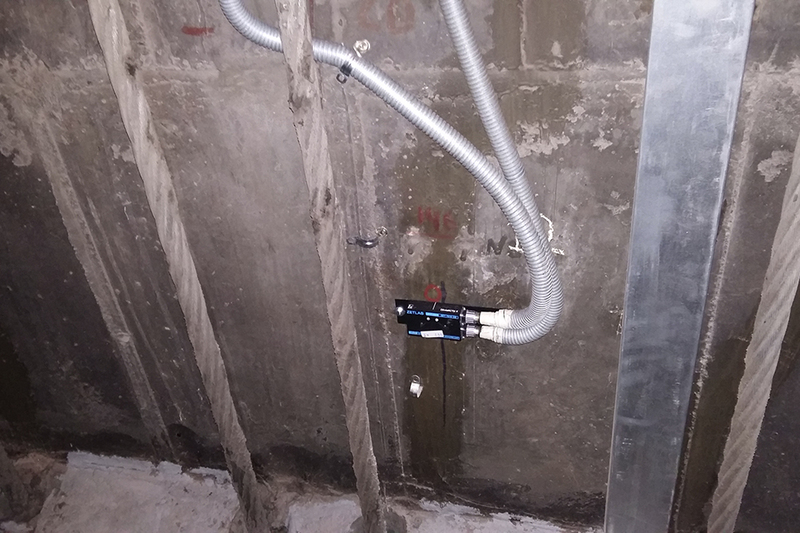 In the case if any other vibration sources are possible, the seismic detection system can be placed in other suitable locations. In the case of interface connection failure between seismic detection and elevator control systems, the elevator control system will activate the seismic mode of the elevator. Schematic structure of seismic protection cabinet as well elements layout scheme are shown in the figures. Indicators “In operation” and “Stop” are located at the door of the seismic protection cabinet. Upon activation of the operation mode, digital seismic detectors installed in the directions of «X» «Y» and «Z» (X is aligned with horizontal plane of elevator’s mounting surface, Y is transverse to horizontal plane of elevator’s mounting surface, Z axis has vertical direction) start recording the acceleration values of the corresponding axes. 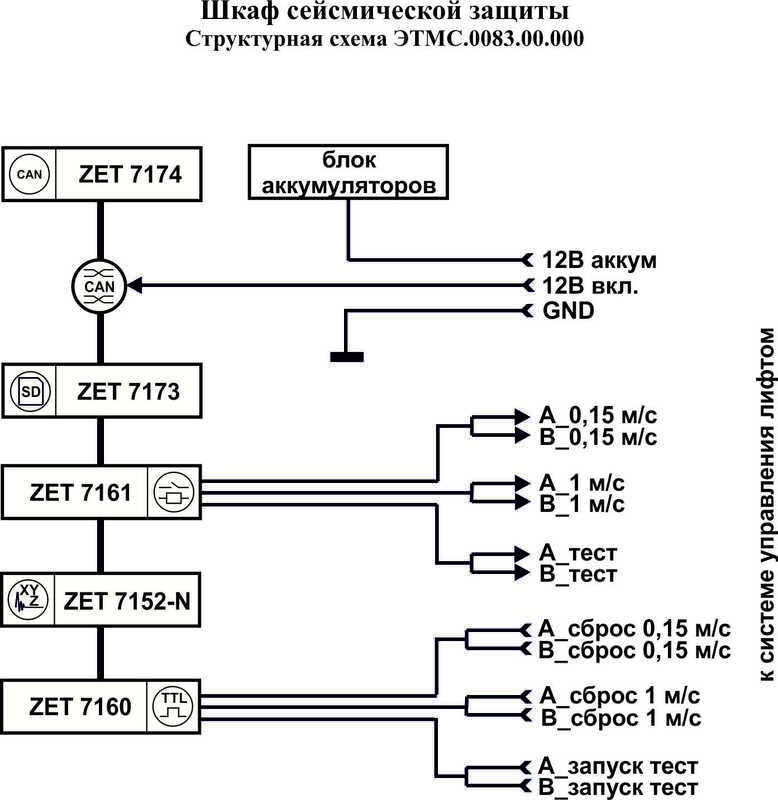 The recorded signals are transmitted to ZET 7173 flash module in digital format as well as to the “dry contact” of ZET 7161. 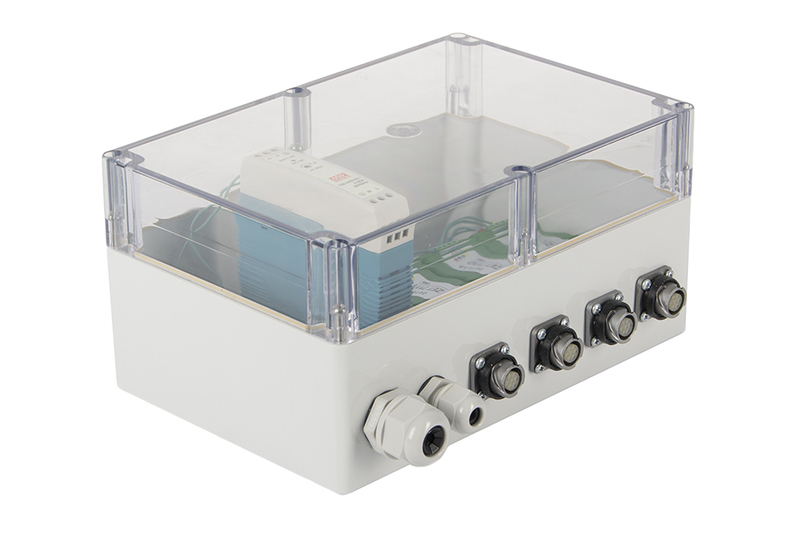 “Dry contact” ZET 7161 control module performs monitoring of the controlled levels for each of the measuring axes (X, Y and Z). In the case if the set acceleration threshold levels are exceeded, there is formed a signal, which is transferred to the relay. The relay, in its turn, produces the “dry contact” signal for the actuator. The “Stop” indicator is activated simultaneously with the “dry contact” signal generation. The seismic protection cabinet should be installed on the bearing structures of the building (walls, columns, etc) located in direct vicinity to the controlled area. The installation is performed using the standard mounting brackets (included into the delivery scope of the cabinet) by means of anchor clamping so that to prevent any looseness at the mounting points. Connection of power supply cables and “dry contact” signal transfer cable to the actuator as well as grounding wire installation should be performed in accordance with the electrical safety requirements.